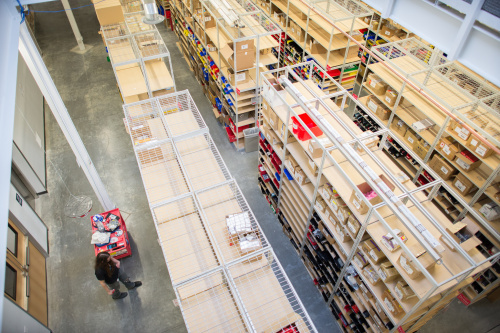 As you probably know, ol' SparkFun started as a place for engineers, students and hobbyists to find products in small quantities for their electrical engineering projects. 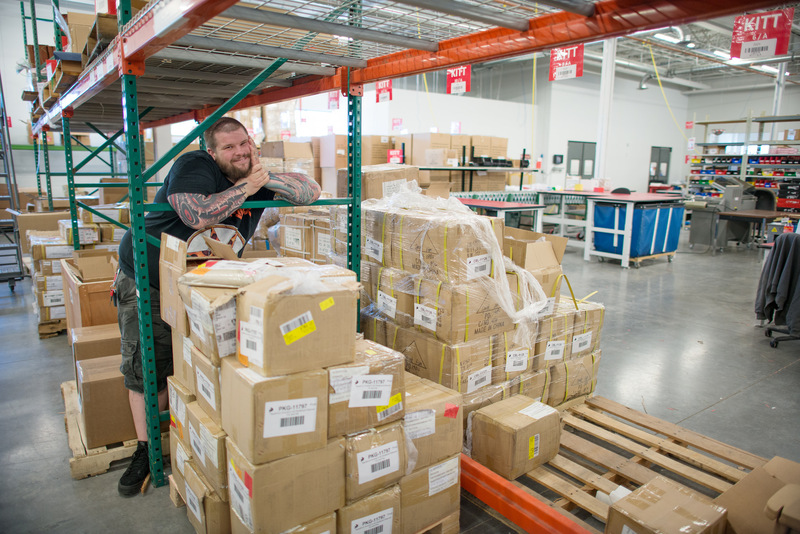 Before SparkFun, many items were only available in large quantities from the manufacturer, and when the average tinkerer only needed one or two, they ran into an issue. We would buy a good chunk of them, offer them in the convenient quantity of one or two and... BAM – we had a business! Look at all that sweet, sweet inventory. But what happens when that tinkerer has a breakthrough, and decides to put the gears into motion for their first run of larger production? What do you do when you need a reel of LEDs or 500 Arduino Pro Minis to get the ball rolling? What happens when you are ready to take the next step? You call me! For a long time we have operated with smaller quantities in mind for our customers. Although each product page has price breaks for up to 100 units, we never really advertised that we can and do offer larger-quantity discounts for most of our products. I'm here today to tell you that we can also easily help you with better pricing and scheduling for your larger-scale needs. 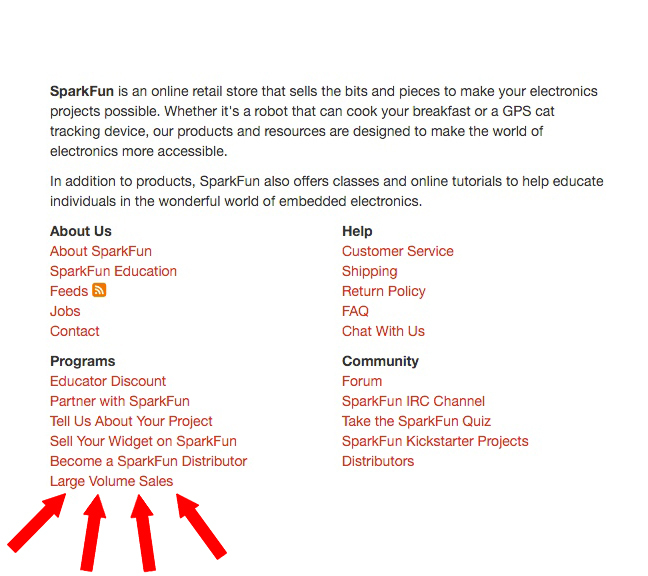 Whether it's a SparkFun-built board or a third-party product we sell in the web store, I can get you a better discount and an accurate lead time to help get your idea built and into people's hands. This is Gordon, and he approves this message. This is an interesting article. So far I have not needed lots of anything, but I need many of few. I have purchased complete sets as I hate not having little components. I have Sparkfun's capacitor and resister sets. From others-lines suppliers I have complete sets of ICs, transistors, even more capacitor and resisters sets, and sets of various LEDs. So I would say that sets of items with an organizer and labels which I have purchased are more what folks might want. Thanks for the nice article. I've been a DigiKey customer since about 1973, and can only think of three times I've contacted their "customer service", and one of those was to praise their packing on a box that literally had been through a train wreck with none of the electronics having been damaged. They were quick and cheerful about correcting the problems. Just for kicks I started poking around and came across their "New Products" page. There are some "professional" electronics folks (for some value of "professional") who don't go to SparkFun.com, but do visit DigiKey's web site. Some of them may find it a handy device. And even if DigiKey actually sells them, I believe that they represent some revenue to SparkFun. I should add that there are "managers" who view SparkFun (and others) as being places that (WRONGLY) can't possibly supply goods of high enough quality to allow orders from their companies, but they won't bat an eyelash at approving an order to DigiKey. As the old saying goes "No one has ever been fired for buying IBM"
I guess what I was getting after in the first place was that Digi-Key, for as big as they are, thinks SparkFun's stuff is pretty cool and even carries quite the arrangement of their products. The reciprocal relationship between them is neat to see.